These steel T-Nuts are threaded and to be used in the aluminum tracks to accept the hardware for a positioning pad. The mounting hardware for the Lateral Trunk Supports, Lateral Hip/Thigh Supports and the Lateral Knee Supports begin with a 90 degree spring steel bracket. This choice of material provides the tensile strength to support significant loads while allowing some flexibility to prevent fractures from occurring in the metal. The decision to oxy coat in black was so the brackets matched our attaching fasteners (nuts, bolts and washers) which are also black oxy coated stainless steel. This is done to improve the appearance of our finished product by having all brackets and fasteners blend in with the seating system. A choice of its configuration is necessary to ensure the Lateral, Hip or Knee pad will extend beyond the cushion sufficiently to allow the pad to provide the clinical benefit necessary. Brackets are sold in pairs. The Round Shaped Lateral Knee Support Pads are commonly mounted to the tubing of the footrests or to the side frame of chair. 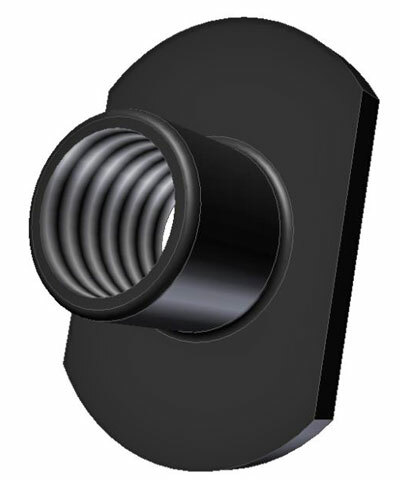 We offer a comprehensive selection of standard mounting hardware for these pads.